Winnipeg will see below-seasonal temperatures on Monday, then rebound back towards a summer sizzler mid-week with daytime highs potentially climbing above 30°C. 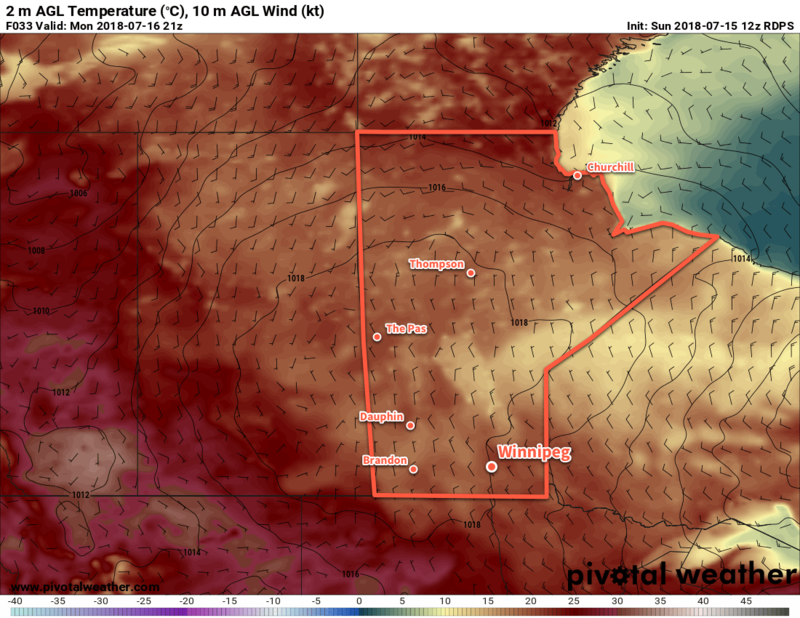 Winnipeg will see markedly cooler temperatures today as a ridge of high pressure builds into the region behind the cold front that moved through southern Manitoba on Saturday night. Daytime high of just 20°C will be the coolest Winnipeg has seen since June 4th when the temperature topped out at 19.7°C. The city will see some cloudy periods, but rain isn’t a concern. Winds will continue out of the northwest at 20 to 30 km/h through the day, then diminish early this evening. Under clearing skies Winnipeg will see a low near 9°C tonight. Significantly cooler temperatures will be in place across Manitoba today with daytime highs generally in the 15 to 20°C range. Tuesday and Wednesday will light southerly winds as a return flow develops over southern Manitoba. Warmer temperatures will build back into the province into the middle of the week. Tuesday will see a high near 26°C, then more summer sizzle arrives on Wednesday with a high near 30°C. Skies will remain sunny on Tuesday, but Wednesday will see mixed to cloudier skies develop in the afternoon. Overnight lows will climb as the warmer air moves into the province. Lows will fall into the mid-teens on Tuesday night followed by a very mild low near 20°C on Wednesday night. Fortunately, humidity levels will remain comfortable for the next 3 days. Muggier conditions are forecast to redevelop on Wednesday night as a more humid air mass spreads out of the Dakotas. At the moment, it doesn’t look too bad with dew points in the upper teens expected. Humidity becomes significantly more oppressive once the dew point exceeds 20°C. Wednesday night into Thursday morning will bring a renewed thunderstorm risk to the region. A low pressure system is forecast to move through the Dakotas and may end up moving northwards into southern Manitoba. If it does so, it will likely support an area of elevated convection on Wednesday night, then generally unsettled weather on Thursday. If the low ends up remaining south of the border, southern Manitoba should still see a fair amount of cloud, but much less rainfall. Cloudier weather will likely stick around for part of Friday as well, then a cold front swings through and ushers in drier conditions. Temperatures should remain warm through the end of the week with daytime highs in the upper twenties and lows in the mid- to upper teens.